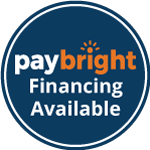 Choosing dental implants is an investment in you. By combining the superior technology of implants, with quality made dentures, you get the next best thing to natural teeth. Dental implants are artificial replacements for natural tooth roots. Made with titanium metal, they attach firmly into the gum and fuse to the jawbone. 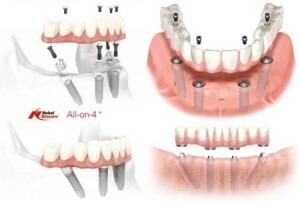 A crown that looks, feels and functions like a natural tooth, is then screwed into the implant. These serve as anchors for partials and full dentures. Permanent fixed teeth are hybrid dental implants that attach to the denture with screws so the denture becomes fixed. This is the closest to having natural teeth and only comes out once a year to be cleaned. 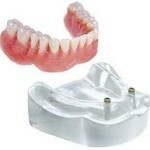 Implant removable dentures are dentures that snap on and off implants and are easily removed at night and for cleaning. 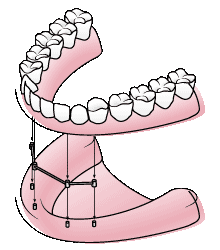 There are a two kinds of removable denture: locator supported dentures and bar supported dentures. Locator supported dentures clip on to the implant. These are suited for people who have a minimum of two implants on the bottom and a minimum of four on the top. This allows the palate of the denture to snap in and out everyday for easy cleaning. Bar supported dentures have a bar that is constructed onto the implant that the denture then secures itself to. There are many different types of bars to best suit your situation. Bar supported dentures are supported by the bar instead of tissue supported and are removable. Go ahead…bite into an apple, chew a delicious steak and smile with confidence! These are as secure as natural teeth.